The Middletown Insider: Have Progressives Won? Despite the advance of so called "Progressive" philosophy in American government, the movement cannot ultimately succeed, because at the heart of Progressivism lies a fundamental contradiction. Watch this video with President Larry P. Arnn and John J. Miller to learn what it is. 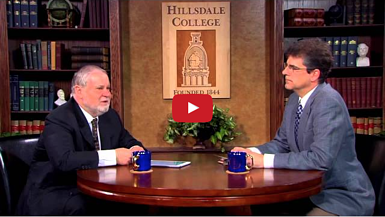 This video is a clip from Q&A 10 of Hillsdale’s online course, “Constitution 101,” featuring Larry P. Arnn, President of Hillsdale College and Professor of Politics, and John J. Miller, Director of the Dow Journalism Program. About "Constitution 101: The Meaning and History of the Constitution"
Hillsdale's free online course, "Constitution 101" examines a number of original source documents from the Founding period, including especially the Declaration of Independence and The Federalist Papers. The course also considers two significant challenges to the Founders’ Constitution: the institution of slavery and the rise of Progressivism. Hillsdale's free online courses are available on-demand and can be taken at your own pace. Register for "Constitution 101" today by clicking here.